Below are two maps for your reference. From I-5 North or South take Exit 21 for Woodland and follow the signs to Cougar, WA or Merwin Dam on Highway 503 (also known as Lewis River Road.) 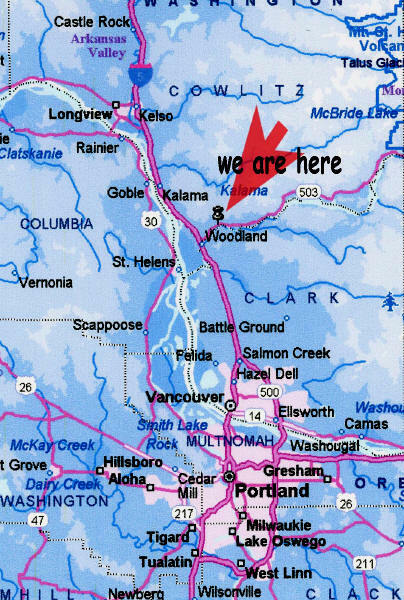 At the point where I-5 intersects with Highway 503 you are almost exactly 4 miles from our house. 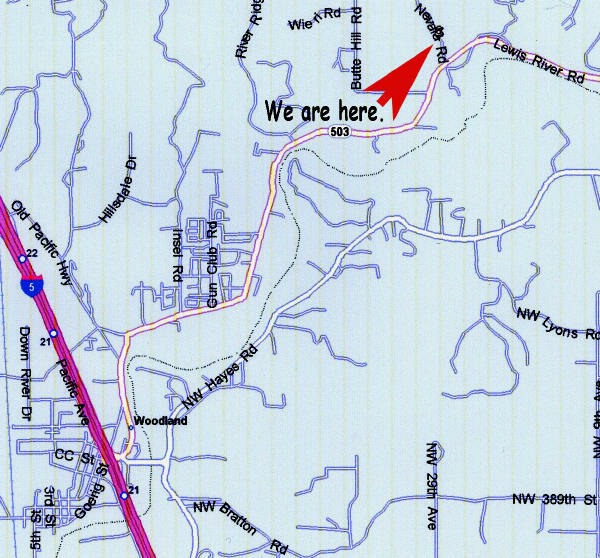 Follow Highway 503 east to Nevala Road for 3.7 miles and turn left or North. As you look up the hill, you'll see our house, studio, and barns on the left side of the road. The drive is the first left up the hill. The pottery studio is between the house and the lower barns. If you have traveled more than 4 miles and haven't found our house, you might be only partly lost. Call if you need help...360-225-1037.